Cosmic rays are very energetic charged particles that continually hit our atmosphere like a steady rain from space. These particles are usually hydrogen or helium nuclei, but can also be nuclei of heavier elements. When such an energetic particle strikes the Earth's atmosphere, it creates a shower of lower energy secondary particles, and these are observed on ground. Nearly a century ago, the Austrian physicist Victor Hess discovered cosmic rays by measuring radiation levels during balloon flights. And he found a significant increase with height, which he correctly attributed to by then unknown penetrating radiation from space. In 1938, Pierre Auger proved the existence of extensive air showers – the cascades of secondary elementary particles - initiated by primary particles with energies above 1015 eV. He observed the simultaneous arrival of secondary particles which are spread over a large area up to hundreds of meters. 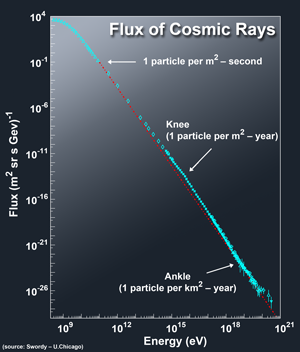 Modern cosmic-ray detectors reveal a cosmic-ray energy spectrum extending to 1020 eV and beyond, a hundred million times greater than that achievable by terrestrial accelerators. The steeply falling cosmic ray spectrum extends over 32 orders of magnitude in intensity. At 100 GeV (1 GeV = 109 eV = 1 thousand million electronvolt), one particle per square metre per second bombards the atmosphere. At one million GeV it is only one particle per square metre per year. And in order to catch one per year of the tenbillion GeV grenades, one needs a full square kilometre! Lower-energy (up to some million GeV) cosmic ray particles that strike the earth come from within our own Milky Way Galaxy. They may originate, directly or indirectly, from the shock fronts of supernova explosions. These explosions throw out fast-moving magnetic fields which accelerates charged particles. Cosmic ray nuclei gain energy when they collide with such a moving reflector. At a magnetic shock, where the magnetic field slows abruptly, particles can become trapped between two reflectors. Like a ping-pong ball caught between two converging paddles, the nuclei make many reflections, and the energy gained in each reflection grows. The process has also been observed in magnetic shocks in the solar wind that flows out from our sun, producing cosmic rays of modest energy. The stronger moving magnetic fields produced in supernova explosions can provide the energy for cosmic rays of galactic origin up to the so called knee of the spectrum. Radio emissions and X-rays give direct evidence that these fronts accelerate electrons to nearly the speed of light. However, the evidence that high-energy nuclei – the main component of cosmic rays – have the same origin is only circumstantial and needs confirmation. Even the largest observed shocks are not strong enough, however, to accelerate the highest-energy cosmic rays. Cosmic rays give clear evidence that something extremely energetic is happening in the Universe, but where? Observational evidence supports the view that cosmic rays with energies above 3 x 1018 eV originate outside our own galaxy. Since they are electrically charged their paths curve as they travel through cosmic magnetic fields. They don’t point back to their sources, except at the very highest energies where deflection becomes small, yet they do not arrive preferentially from the disk of the Milky Way or the side of the sky toward the center of the Galaxy. This strongly suggests an extragalactic origin. Although we have not confirmed any source in the cosmos that can produce such energies, several hypotheses have been proposed. These include radio galaxy hot spots and active galactic nuclei (AGN) jets. Fortunately, the suspected sources are also predicted to emit by-product particles which travel in straight lines: gamma rays and neutrinos. Indeed, gamma rays with energies up to a hundred thousand GeV have been observed from a variety of sources. In most cases, however, it is not clear whether they are produced in high- energy proton interactions with the ambient matter, or whether they are radiated by electrons. Here, neutrinos may come to the rescue: they can only be produced in processes including protons and nuclei. 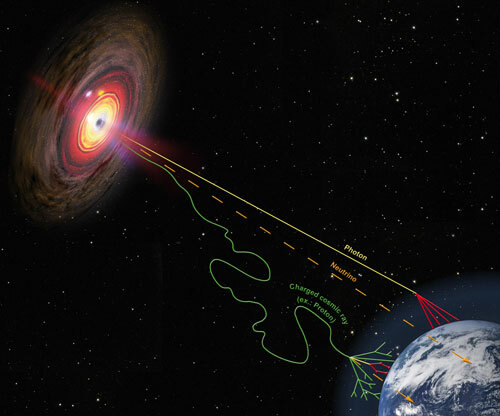 The last decade has witnessed the birth of a new field of astronomy – Very High Energy (VHE) gamma ray astronomy – expanding wavelength coverage of astronomical instruments by another 10 decades towards the highest energy radiation. These gamma rays are produced when high energy cosmic rays bump into interstellar gas, creating a bunch of elementary particles. Unlike charged cosmic rays, the gamma rays travel on a straight path and point back to the point in the sky where they were produced. Apart from serving as tracers of cosmic rays, speculation is that some VHE gamma rays may result from decays of relic particles with have survived since the Big Bang, such as the mysterious dark matter particles; detection of such gamma rays would give first hints towards the nature of dark matter. VHE gamma-ray astronomy is becoming part of mainstream astronomy, with surveys of the Galaxy revealing dozens of VHE gamma-ray emitting cosmic-ray accelerators. Objects discovered include supernova remnants, binary systems, pulsars, stellar associations and different species of active galaxies, hosting super-massive black holes at their centres. The mystery of cosmic rays is going to be solved through an interplay of detectors for high energy gamma rays, neutrinos and charged cosmic rays.